Arrested Ear Syndrome, which causes partial or complete failure of the maize ear, has recently begun to appear in local maize crops. Grant Pringle, agronomist from Pannar Seeds, details possible causes, effects and treatment. This ear has arrested completely and is undeveloped. 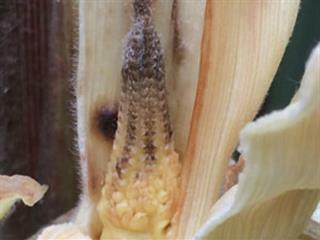 Relatively unknown in South African maize production, Arrested Ear Syndrome (AES) has made an unwelcome appearance in this country in recent seasons. 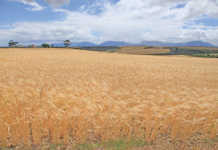 Some local farmers have realised only half their expected yield, due to a high incidence of AES. Reports of AES – also called Blunt Ear Syndrome – have filtered through from the US corn belt since the late 1990s. The condition is not caused by a pest or disease, but is linked to plant stress at a sensitive stage of ear development. The syndrome causes partial or complete abortion of the ear during the late vegetative growth stages of the plant. In all other respects, a maize plant with an arrested ear usually appears normal. Often, however, as the season progresses, the stems and leaves of plants with severe AES may colour red or purple because of sugar deposition. Partial arrest. The base of the ear is normal but the top two-thirds are absent. Note the arrested primordial remnant on the tip of the ear. The stunting or absence of the ear has a direct impact on the yield potential of the affected lands. In lands with a high percentage of arrested ears, one would expect the yield loss to be in a similar proportion to the AES. One theory proposed to explain AES in the US is cold stress, associated with a sudden drop in average temperature. Due to the unpredictability of AES, the exact cause and timing of the stress event that results in ear arrest has been difficult to determine or replicate, despite various studies. In 2007, numerous reports of AES emanated from the Midwest corn belt in the US. Researchers from Purdue University investigating AES events recognised a common thread to these. In nearly all cases, a pre-tassel application of crop protection chemicals, often including adjuvants, had been applied. In 2008, the researchers set up lands to test whether the chemicals used in spray form could have increased the incidence of AES. They applied three fungicides in all, sprayed on their own and in various combinations with insecticides, adjuvants, spray additives and herbicides. The different treatments were assessed for AES, and compared with an unsprayed control block. From the graph above, it appears that the greater the number of components added to the spray mix, the higher the rate of AES. Close-up of the remnant tip of the ear. 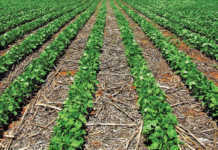 In lands where fungicide alone, or fungicide plus an insecticide, were applied, the incidence of AES was zero – no different to that of unsprayed control lands. AES appears to be linked to the presence of non-ionic surfactants (NIS) and crop oil concentrates (COC), both of which are common ingredients in adjuvants, and to multi- chemical tank mixes. An array of AES symptoms observed in a land, from almost-normal ears to cobs without kernels, to complete arrest. 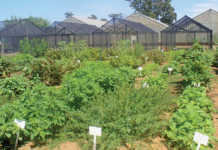 In 2009, agronomists from Beck’s Seed (US) demonstrated the effect that NIS applications had on increasing the incidence of AES. In their demonstration, the crop protection spray was also applied at V14. The differences between sprayed and unsprayed lands are shown in the table. Although the report extracts tend to indicate that applying crop protection sprays at certain plant growth stages can cause AES, plenty of lands have received this treatment with no reports of ill effects. Stick rigorously to crop protection chemical label instructions. Avoid, as far as possible, any sprays between V10 and VT (tasseling) growth stages of maize. If a spray is vital within this window, apply only the chemical required for the intervention. Do not include additional adjuvants or extra crop protection chemicals/foliar fertilisers to the spray mix. Avoid spraying crops that are under climatic (particularly cold) stress. Crop protection chemicals are by design applied to protect the crop and maintain its yield potential. However, the adage, ‘You can’t get too much of a good thing’, does not apply in this instance. For further information, visit www.agry.purdue.edu and www.extension.purdue.edu. Phone Grant Pringle on 071 678 1511 or email [email protected].